This review first appeared in the July 2009 issue of hi-end hifi magazine High Fidelity of Poland. You can also read this review of the Wavelength Audio Cosecant V3 in its original Polish version. We publish its English translation in a mutual syndication arrangement with publisher Wojciech Pacula. As is customary for our own reviews, the writer's signature at review's end shows an e-mail address should you have questions or wish to send feedback. All images contained in this review are the property of High Fidelity or Harbeth. - Ed. The USB DAC is a category conceived by Wavelength Audio. It's really just a classic digital to analog converter equipped with a USB input and optimized for use with a computer. 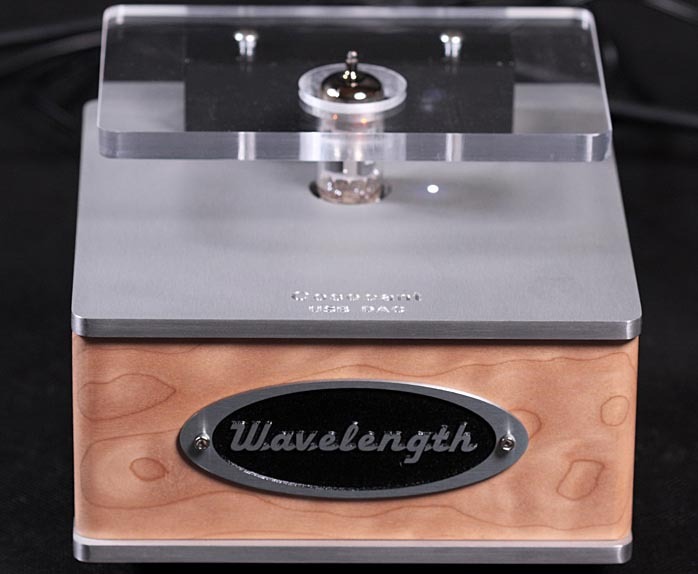 Because we already reviewed the Wavelength Brick, we know that this company is not just another 'run of the mill' manufacturer who felt the market tide, put a DAC together in his garage and announced its brilliance to the world. The most pronounced difference and working to Wavelength's advantage is the fantastic support on the company web pages devoted to these devices where you will find detailed instructions on how to turn your computer into a valuable sound source and how to make it have optimal sound working conditions. And this is not so easy. Neither Mac nor PC are sound-friendly devices and some tweaking must be done to coerce them into playing that role. The model Cosecant v3 under review was first presented at the 2004 CES. It is more expensive than the Brick and adds new things. Now in its 3rd iteration, first of all we get a new converter chip. Earlier it was a 16-bit Philips without a digital output filter, now it is a 24-bit/96kHz Wolfson DAC to accommodate high-resolution files. But this is far from everything. The converter is mounted on a separate PCB called the Numerator and this can be swapped for the same Transcendental module as in the Brick. I got both for review. After that there is a tube output stage with a NOS ECC86 double triode coupled to the RCA sockets by means of transformers, not capacitors. And finally inside we find small switches to set the output to balanced meaning a floating ground (although this is still an RCA); or unbalanced. Stereophile's measurements made during Art Dudley's review (June 2009, Vol. 32, No.6, pages 77-85) showed clearly that the latter setting produces less noise. This I can confirm with my own listening tests. High resolution recordings sounded clearer and the instruments were better articulated when the switches were set to unbalanced. Test records: Barb Jungr, Love Me Tender, Linn Records AKD 255, SACD/CD; Barb Jungr, Love Me Tender, Linn Records, AKD 255, FLAC 24/88.2; Christian Willisohn, Hold On, Stockfisch Records, SFR357.4038.2, SACD/CD; Milt Jackson Sextet, Invitation, Riverside/Mobile Fidelity, UDSACD 2031, No. 01828, SACD/CD; Oscar Peterson Trio, We Get Request, Verve/Universal Music Japan, UCCU-9651, SHM-CD; G. F. Händel, Messiah (Dublin Version, 1742), Dunedin Consort & Players, Linn Records, CKH 312, 3 x 180gr LP; G. F. Händel, Messiah (Dublin Version, 1742), Dunedin Consort & Players, Linn Records, CKH 312, FLAC 24/88.2; The Beatles, Love, Apple/Parlophone/EMI, 3798081, 2 x 180gr LP; The Beatles, Love, Apple/Parlophone/EMI, 798102, CD + DVD-A 24/96; John Coltrane, Blue Train, Blue Note/Classic Records, HDAD 2010, DVD-V 24/96+DVD-A 24/192; Helge Lien Trio Hello Troll, Ozella Music, OZ021CD, FLAC 24/96. Sound: The Cosecant is a completely different chapter than the Brick. Its tonal balance is set much lower and timbres are warmer. This is why I won't say unequivocally that it is better. In many aspects it creates a nicer, more relaxing sound having nothing in common with 'digital', computers or networks as though its creator wanted to discredit the common belief about digital carriers and show that their glassiness, brightening and clinical sound are just distortion and not actually written to zeros and ones. You have to pay a certain price for this -- more about that momentarily -- but if that was really the purpose of the Cosecant, then Gordon Rankin succeeded completely. One more thing. Although tonally and resolution wise I like the Brick better, plugging the Transcendental card into the Cosecant (identical to what is in the Brick - no oversampling) in place of the 24/96 Numerator was a backwards step, confirming that the output stage of the Cosecant is superior. So why won't the Brick concede defeat? I do not know for sure. You have to compare the two and decide which one better serves your needs.